Film professor and historian, Dr. Gary Rhodes, has always exhibited a tenacity for attention when digging for details on his many books and articles on motion pictures. Just a glance at the huge number of chapter footnotes demonstrates that fact. How Dr. Rhodes interprets these facts is further evidence of a rare genius for cinema history. 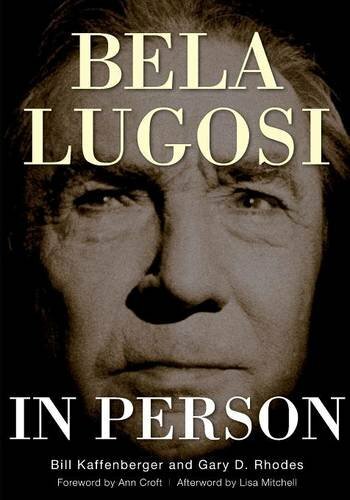 In his most recent book, BELA LUGOSI IN PERSON, Rhodes works with co-author Bill Kaffenberger to produce one of the most thorough actor biographies this writer has read in the last 50 years. Until now, the most uniquely complete book in the field was W.C. FIELDS BY HIMSELF, written by—rather, one should say—compiled with commentary by Fields’ grandson. The young heir to the family estate found a long lost trunk hidden away in the attic. Said trunk was filled with correspondence between the great comedian and other celebrities the likes of which include John Barrymore and Edgar Bergen as well as W.C.’s family members. Grandson Ronald J. Fields turned these missives into the enthralling story of Fields’ life. In the new Lugosi book, Rhodes and Kaffenberger didn’t have the good fortune to locate a previously unknown treasure trove of family letters. Instead, they dug deep into libraries and newspaper archives. They also conducted some excellent interviews. The book concentrates on the appearances of Lugosi; stage tours of DRACULA, ARSENIC AND OLD LACE and the variety style stage act Bela worked up to tour with Ed Sullivan’s live STAR DUST CAVALCADE. Most prior Lugosi books focus mainly on the film career and do indeed support the “Poor Bela” myth that the actor didn’t work much. This more complete chronology of live appearances confirms that Lugosi was a very busy actor away from the sound stages of Hollywood. The Rhodes/Kaffenberger masterpiece is slightly more than 400 pages and displays as many electrifying—and rare— illustrations, including a snapshot of Bela at home, playing the piano. Every horror fan will love the newspaper ad for FRANKENSTEIN MEETS THE WOLF MAN (which ran March 24, 1943) in the Boston Globe. It’s a cut & paste, hand-made affair announcing the “3rd Horrific Week” and promotes the film as starring Lon Chaney and Bela Lugosi. Yes, there is a listing for Ilona Massey, but in very tiny typeface. That ain’t the way the Universal pressbook tried to sell the film! The number of “firsts” in this volume is phenomenal. Chapter 9 (which concludes with 84 endnotes) details the one-hour TV show from 1950 entitled MURDER AND BELA LUGOSI. Little is actually confirmed about the show, but what is revealed is remarkable. Other chapters chronicle the merciless spying into Lugosi’s private life by the Office of Strategic Services. It was assumed he was a Hungarian Communist and numerous reports were filed on his most mundane activities. Also fascinating at seldom seen ads, photos and reviews from other live performances, including TOVARIC, MURDER AT THE VANITIES and a detailed timeline of personal appearances. The foreword by Ann Croft and Afterword by writer/actress Lisa Mitchell are delicious treats to round out this well-illustrated and documented volume. In short, every cinema, horror and Bela Lugosi fan/student needs BELA LUGOSI IN PERSON in their personal library.